The beaches in Ocho Rios with it's beautiful white sandy beaches, sparkling turquoise seas, golden sunsets create fairy tale settings for you to relax and totally unwind. What better way to relax than with an ice cold Redstripe or a Jamaican rum laced cocktail and just listen to the gentle waves lapping the the beautiful white sands along the beach. A perfect tranquil moment you will always remember. 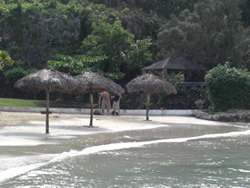 The beaches are secure, safe and very clean; offering all the amenities that you come to expect. Lazy your time away on one if the many sun lounges or take a dip. The are lifeguards on duty and watersports activities for the more adventurous. In 1966, a small area of the coast of Ocho Rios was declared a protected area. This was the original study site of Dr. Thomas Goreau, a world famous marine Biologist and founder of the Discovery Bay Marine Laboratory. 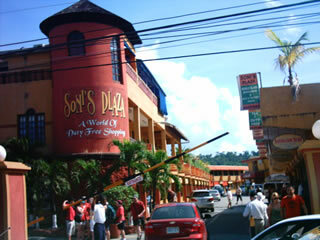 The New Ocho Rios Plaza hosts sixty different shops near the center of town, and other plazas can be found closer to the cruise docks and resorts. The Ocho Rios Craft Park is one of several handicraft venues, with one hundred fifty vendors selling carvings, traditional woven crafts, and even personalized items. Ocho Rios Craft Park located in the center of town with 135 stalls. A vendor will weave a hat or a basket while you wait, or you can buy a ready made hat, hamper, handbag, place mats, or lamp shade. Other stands stock hand-embroidered goods and will make small items while you wait. Wood carvers work on bowls, ashtrays, statues and cups. Island Plaza located in the center of town has some of the best Jamaican art, all paintings by local artists. You can also purchase local handmade craft, carvings, ceramics, kitchenware and the inevitable T-shirts.